Winter turns my mind to dessert wines. Often very sweet and heavy, I don’t tend to drink them at all in the summer/warmer months. Thus, they start to pile up in the basement. We probably have a good 20 or so bottles of dessert wine hanging around, ranging from port-style wines to Ice wines. Also, with just the two of us, a bottle would hang around for a little while as they are just a bit too sweet for me to enjoy more than a cordial glass or so at a time. Matt really likes them though! Since my parents were visiting, it seemed like a great excuse to break out a dessert wine and we chose the 2007 Bella Late Harvest Zinfandel. We purchased this at the winery, though I can’t recall now what we paid for it. On the nose I found blueberry, blackberry, blue fruit, spice, bittersweet chocolate, and blueberry pie filling. In the mouth I got blueberry pie, spice, blackberry, and a slight hint of chocolate. While sweet, it wasn’t too sweet for my tastes and I enjoyed the long finish. Everyone loved this bottle and it wasn’t long before it was only a memory. 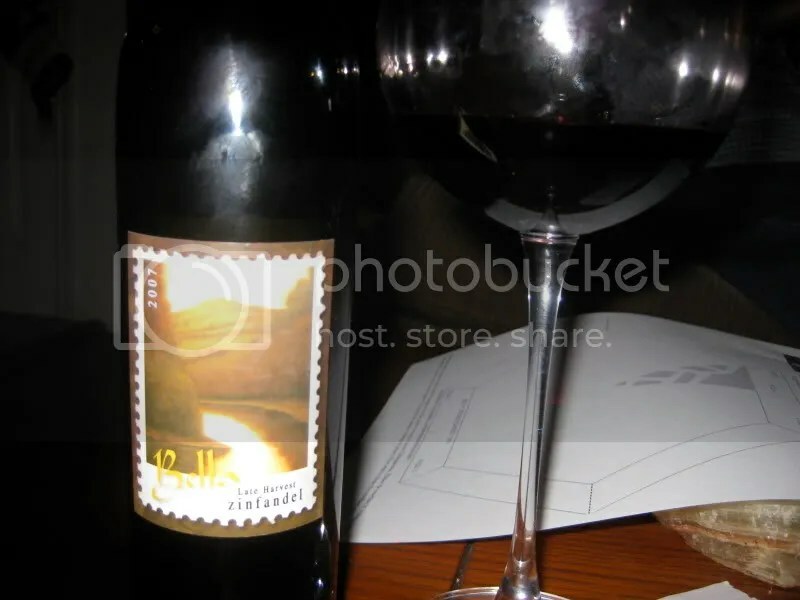 Filed under: Bella, Dessert Wine, Red, Wine, Zinfandel |	Comments Off on Stickies! 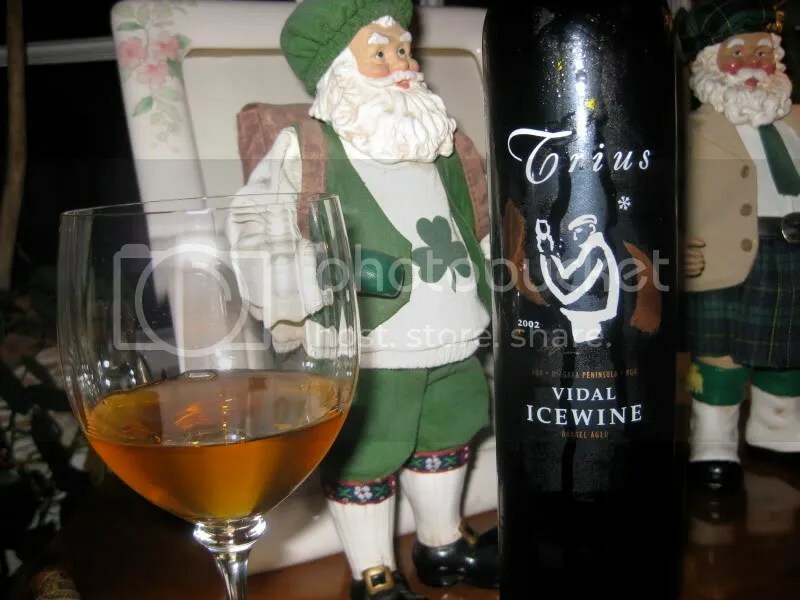 In the spirit of opening dessert wines while we visit, my dad pulled out a bottle of Ice Wine from Niagra, Canada. Now, dad had never heard of Ice Wine until a couple years ago when we went to Farrah Olivia for dinner and I ordered a glass with my cheese course. Since then, he picks up new bottles whenever he sees them at the store. 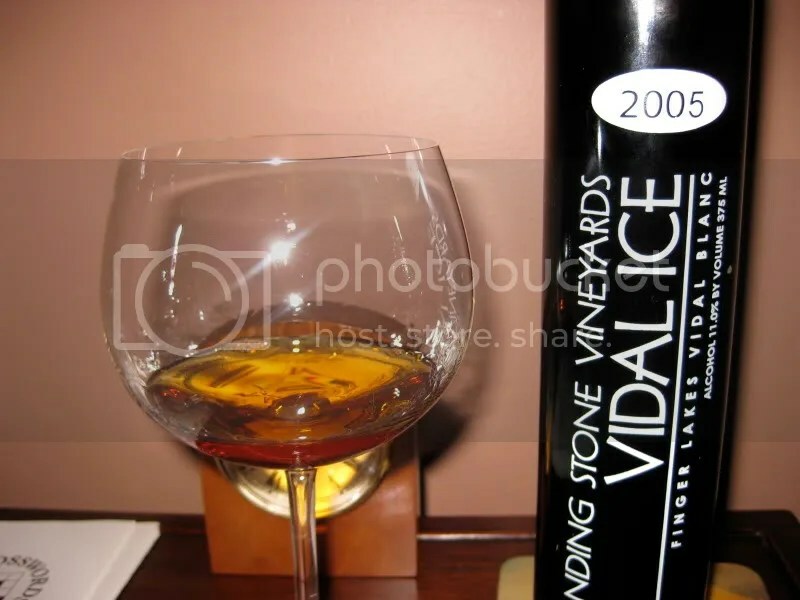 Tonight he opened the 2002 Trius Vidal Ice Wine. It had a real cork closure, clocked in at 12% alcohol by volume, and retails for around $40 for a 375mL bottle. I first noted the dark color of the wine in the glass. 7 years out and it looked well aged. On the nose I found honey ,apricot, white flowers, nectarine, and orange blossom. In the mouth, more apricot, honey, stone fruits, orange, and other citrus. It had great acidity and was very smooth. Even my mom, an total non wino, loved this one! We headed up to NYC this weekend to visit with my inlaws (thankfully we took the BoltBus were I could catch up on email and such uninterrupted for 4 hours!!). 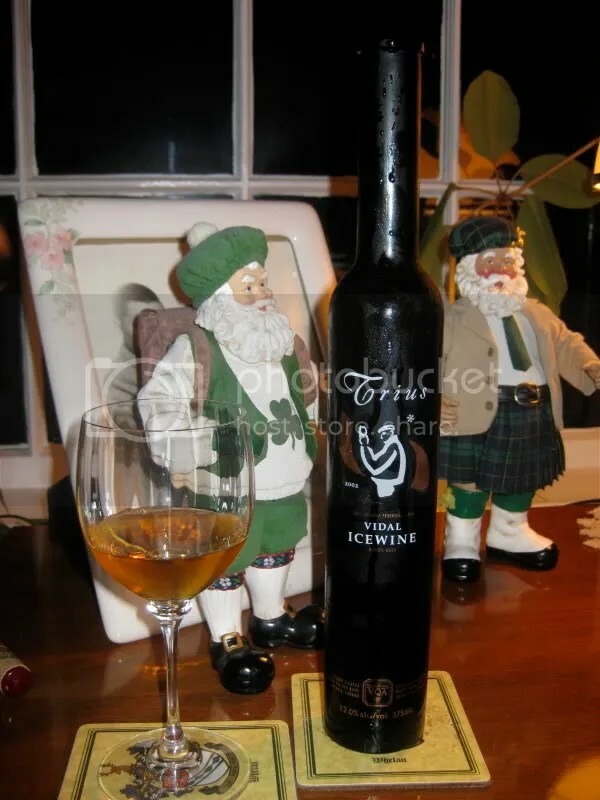 While there, we stayed with some family friends who left us a bottle of Finger Lakes Ice Wine on the counter! I don’t get many chances to try wines from NY, so I’m always happy to taste one…I imagine it’s a bit like VA wines, you don’t see them too often outside the state of origin. After a long day spent watching the Yankees lose (sob) though enjoying the fact that Matt’s birthday wishes got posted on the big screen at the game, we retired to our friends’ apartment and cracked open the 2005 Standing Stone Vineyards Vidal Ice Wine. It has a plastic cork closure, clocks in at 11% alcohol by volume, comes in a 375mL bottle, and looks to retail for somewhere between $20 and $25 for the bottle. 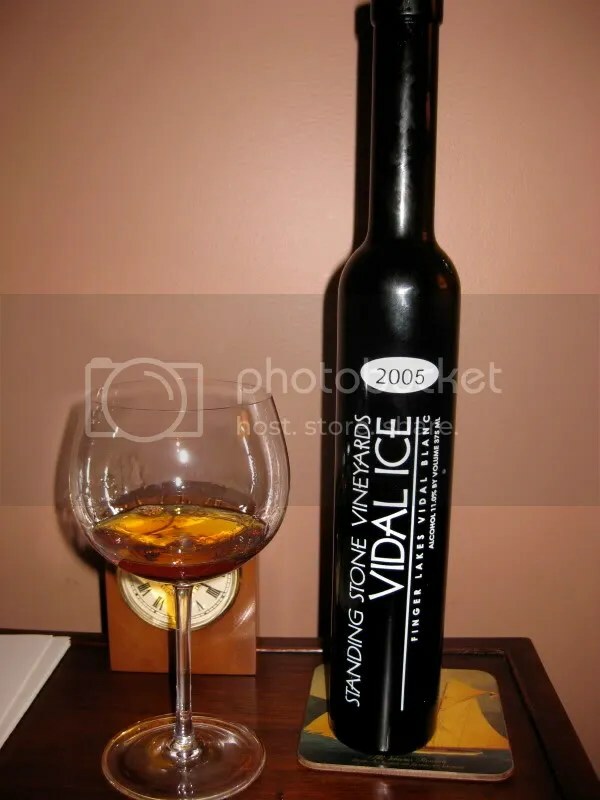 I’m unsure if this is made in the ice wine style or if the grapes are actually frozen on the vine. The color on the wine almost looked like brandy to me…I was surprised at how dark this wine was. On the nose I found honey, flowers, apricot, sweet apples, candied pear, and a general sense of candied fruit. In the mouth I got flavors of honey, sweet pear, yellow apples, apricot, and candied pineapple. While the wine was definitely sweet, it had great acidity. I would love to try this with a selection of blue cheeses…it could take the place of the honey I usually drizzle on blue cheese! Oh, and I can picture pouring this over some of the homemade French vanilla ice cream that I like to make….yum! I found this bottle of dessert wine lurking in the cellar during one of our reorganization projects. I purchased it in 2005 from the Williamsburg Winery in Williamsburg, VA back when I lived down there and was a frequent visitor, particularly to scoop up bottles of the Governor’s White! This wine was a 2002 Williamsburg Winery Late Harvest Vidal. I bought it at the winery, it had a real cork closure, clocked in at 11% alcohol by volume, had 13% residual sugar, and I couldn’t tell you what I paid, though the current vintage sells for $24. On the nose the wine was sweet, showing honey and apricot. In the mouth, much of the same. It has held up incredibly well over the years, and actually tasted even better than I remember. The color had also intensified, though I can’t find the picture of it that I took for you. Given how well it’s drinking now, but also taking into consideration that it still had a nice backbone, I’d say this one still has some life for aging in it. I will also admit that it was not stored under perfect conditions….it lived on my counter wine rack in my townhouse for well over a year, survived a summer in VA in un-airconditioned climate, then lived in the racks in our one bedroom apartment for almost a year before it moved to our house for almost another year. And it still tasted great! And just a very quick review as I seem to have misplaced the picture for this bottle! 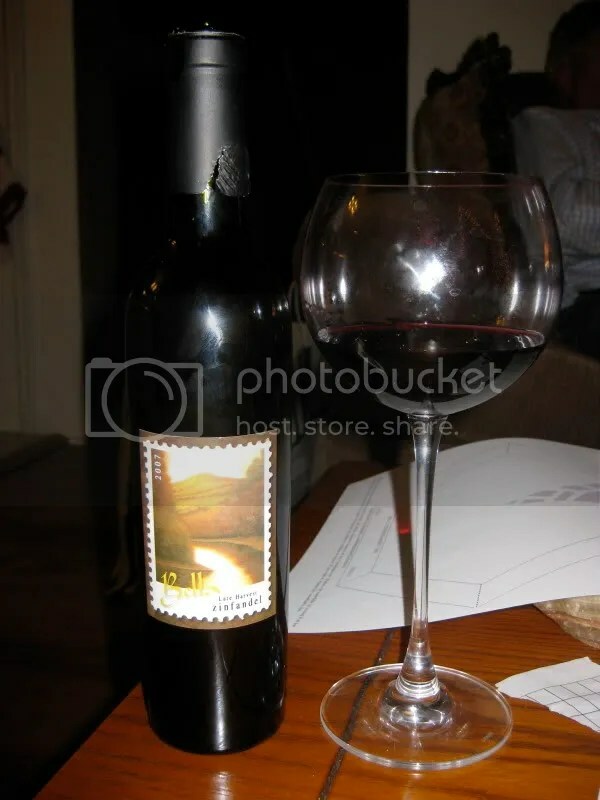 The wine was a 2005 Bella Vineyards Late Harvest Zinfandel from Big River Ranch Vineyards. It clocked in at 14.5% alcohol by volume, had a real cork closure, and cost us $20.40. I can’t recall if this came in a club shipment or if we picked it up at the actual vineyard. We drank this for dessert on Christmas (did I mention that I got really backlogged on wines over December?) with various cookies and puff pastries. On the nose I got blackberry and spice. The nose was sweet and very pungent. In the mouth, it tasted like blackberry wine and was quite sweet. We hosted a dinner party on Friday night for several of Matt’s coworkers. Since it was my day off, I got to spend the day prepping food and picking out wine to serve. A total of 5 bottles of wine fell here on Friday, 2 whites, 2 reds and a dessert wine. With them I served a platter of assorted cheese and crackers, bruschetta, homemade pizza (1 pepperoni, 1 ham and pineapple) and chocolate mousse with raspberry sauce and fresh whipped cream. The first wine served was a 2005 Fritz Russian River Valley Sauvignon Blanc, served with the assorted cheese and crackers. I’m almost always a fan of a crisp sauvignon blanc with cheese, especially when I’m serving creamy, tongue coating cheese, and this was no exception. We picked this bottle up at Fritz for $16.20 this summer, real cork closure and 13.6% alcohol by volume. A great match! Crisp, tart and acidic on the finish. Fairly citrusy, with lemons and grapefruits on the nose and the mouth. A nice long acidic finish. I’m glad we have a few more of these hanging around. Second was a bottle of Quivira 2004 Syrah. I don’t remember if this came in a club shipment o if we bought it at Quivira, but it was $28.00, had a real cork closure and is 14.4% alcohol by volume. This bottle was a big hit with all of our guests and was served with the pepperoni pizza. A deep inky purple, it was a beautiful glass of wine. I decanted it for nearly an hour before serving, which was definetly a good call. There was vanilla and spice on the nose, and also a distinct scent of bacon. In the mouth there were blackberries and currants. It had a big mouth feel and was smooth, but the alcohol was there, so decant! Third was a bottle of Ferrari Carano 2003 Zinfandel. At 14.8% alcohol by volume, this was a big wine. It had a real cork closure and ran us $21.60. This one is done, it didn’t need to be decanted at all, if you have it drink it now. We have one other bottle and I will serve it asap. Raisins and black currants on the nose, with blackberries in the mouth. It had a very nice finish and I didn’t even notice the big alcohol. This was not the typical big zinfandel, it was more reserved and not too fruit forward, but an excellent balanced bottle. I served this with the ham and pineapple pizza. Drink up now! Forth was a bottle of Trentadue Chocolate Amore Red Dessert Wine. Now, if you want to talk about big alcohol levels, here it is! This one sits at 18.5% alcohol by volume, had a real cork closure and I don’t remember what it cost. It’s a very tasty and well done dessert wine, though the chocolate is flavor added. Under the chocolate, there were layers of red raspberry. It was fairly thick, but this is probably Matt’s favorite dessert wine ever. I served it with chocolate mousse. Finally, a bottle of 2005 De La Montanya Fume Blanc. 14.6% alcohol by volume, a real cork closure and cost us $16 at the vineyard. This was floral and aromatic on the nose. In the mouth there was green apple. A crisp wine with a good structure and a decent finish. I thought the flavors in this bottle were very well done and it was definitely a good value. I think we have 2 more of these hanging around. Phew, that was a long one, but an excellent party, with excellent food if I do say so myself and delicious wine!